This picture (above left) is one of the oldest I have in my files of Woldumar Nature Center. I took the photo on October 17, 1987 in what I believe is the area identified on the map as hardwood forest. 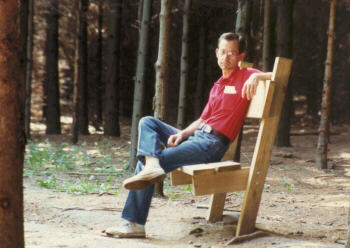 I actually became aware, and a member, of Woldumar in the early 1980s. I am still a member today. It is the longest running affiliation I have had with any organization. Yet, it is not the organization which has kept me connected. Like with all groups, there have been a number of ups and downs. However, the earth remains constant. It is with the land that I have felt that special bond, pretty much right from the start. I do not get over there as often as I would like, but it always feels like coming home when I do. I believe it was as a parent chaperone for either my son's or daughter's elementary school field trip, which introduced me to NWA (old name's initials) and Woldumar. By the year 1987, we had become regular attendees at events. All of the photos so far have been from 1987. Perhaps you noticed in the Civil War camp photos things are a little greener. That is because they were taken in May, not October. Today, I tend to associate their (the soldiers) presence with the American Heritage Festival, which has since been moved into late September, from its original October time slot. In May, we now have the Wildflower Weekend. But that is a recent years addition to the events schedule. I am honestly not sure what would have been taking place in May of '87. I spent a short time on the governing board for Woldumar. During that period, others were questioning the benefit of continuing the American Heritage Festival, considering the cost and man hours it took to hold the event, and that it was not directly related to the primary environmental education mission of the organization. I am proud to say, I was one of the voices who championed the continuation of the festival, as an outreach to the community, and an introduction to Woldumar for those who might not otherwise find their way here. I have set up a page with more photos of the festival in recent years. You may click this link now, or wait until the bottom of the page, where a selection is given for it and the log cabin. Speaking of the log cabin . . . 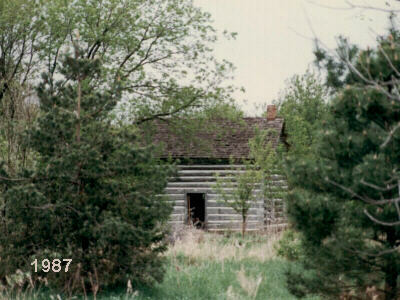 The "Moon Log Cabin," originally located on Canal Road southeast of Mt. Hope, "was donated in the early 1980s and moved to Woldumar. One of the oldest residences in Eaton County, its restoration preserves the cabin to 1860 when it was first inhabited. It is the only known historic house of log construction in Eaton County that is being restored and preserved. Two stories high, the cabin is an impressive and well-built structure. Its State Historical designation requires any restoration must be done accurately, historically, verifiable to the time period in which the Moons lived in the cabin, and proven through writings or photographs. Volunteer docents provide historical information during special events." One of our friends was a cabin docent for a number of years, so we have had ample opportunities to visit and hear the history. It is well worth a trip to Woldumar during a festival, if you have never been in the cabin. I think, more than anything, I enjoy the basic smells and special aromas when the wood cook stove is fired up and somethin's-a-cookin' . . . The photo on the left (below), like the others, is from 1987 (May). The picture on the right was taken on May 10, 2008. You may click on either picture to see more images of the log cabin, inside and out. Woldumar's mission is to educate people about the natural environment. 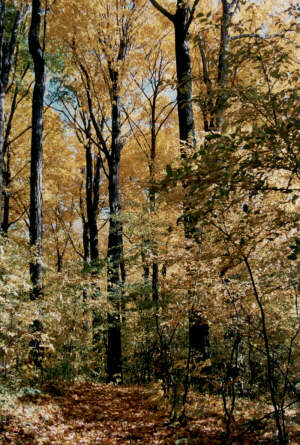 "Woldumar's 150 acres provide many natural environments. The prairie with its wildflowers, the Grand River flowing along 1.25 miles of riverbank, the hardwood forest containing beech and maple trees, the old apple orchard where deer come for dessert, offer a variety of habitats for native plants and animals. Visitors to Woldumar can experience all these areas using the 5 miles of natural trails that are open to the public daily dawn to dusk. The grounds contain designed areas including a butterfly garden, xeric garden, and herb garden. Another garden is used as a nursery area where young trees are protected until they are large enough to be moved to their permanent homes on the grounds." I enjoy visiting almost every area of Woldumar. Each has its own distinctive feel. Some have changed dramatically over the years, while a couple have remained surprisingly much the same. Transitions are gentle, as each connects with the whole. One of the primary spots I try to be sure to swing by on each visit is the Woodland Pond area. It is a pretty place in and of itself. However, at the right time of year, if you happen to hit a special moment, you might also be blessed by serenading frogs, hear the song of a loon, view turtles, Blue Heron, Muskrat, or perhaps even passing deer. Some of these are pictured on the page designated Woodland Pond in the links at the bottom. You can also click on the picture (at left) to go directly to that page. 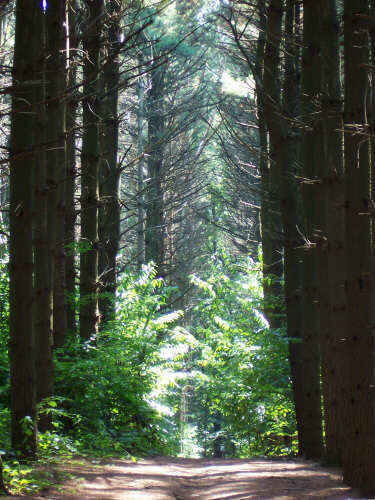 For a long time the White Pine Plantation was the most special spot in all of Woldumar for me to visit and pause to embrace its peace and solitude. Transitioning as all forests do, the undergrowth and deciduous trees are becoming more prominent now, and the old feeling of being in an open natural cathedral is passing. Still, it remains a primary destination on any of my walks, when wandering Woldumar. "Wandering Woldumar" is the title of a poem I wrote in 1991. The self-portrait below (my 39th birthday in 1989) links to the poem. Clicking on the picture at right takes you to more photos of the White Pine Plantation. Both links appear at the bottom of each page, as well. The Woodland Pond (see above) is partially adjacent to the pines as shown on the map. There is also a smaller pond just west of the pines. I have included pictures of it on the Pines Plantation page because it is so close in proximity. Staying with the waters of Woldumar for a moment, you can see on the map (and mentioned in the text) that there is a fair amount of river frontage and a rather large lagoon stemming from the river. Sometimes, the colors along the lagoon in the Fall are absolutely stunning. The below photo, taken late in the season, only hints at the beauty I have seen in this area. Unfortunately, I have never, to my satisfaction, captured the peak color in a photograph. As you are likely guessing by now, you can click on the photograph to jump to more images of the Lagoon & Riverfront, or you may wait until scrolling down through rest of this page, where you will find a link among the others already mentioned. As we leave the water areas and head into the woods or onto the prairie, I would like to take a moment to mention the controlled burns which must take place occasionally to keep the prairie healthy. For too long we failed to understand the importance of fire in the cycles of life. Today, as we learn more, contained fires strike a balance long absent from our environmental efforts. It does make for a rather interestingly textured landscape though, as you will see in the following pictures. Since this is the only page they appear on, I have included several images I took after a burn in April of 2007. The five miles of trails covers a lot of different habitat. Some areas you have already seen above. I actually have over a thousand pictures taken along Woldumar's many trails. I have selected some to share on the "Along The Trails" page which you can access by clicking on the left photo below. I have also set-up a page called "Buildings & Structures" where in addition to those named items you will also see some images of the beautiful flowers planted around the infrastructures, pictures from the wildflower weekend, and some information about purchasing my images through the Woldumar gift shop. It is one of the few places I still sell my photography. That page is directly accessible by clicking on the below right photo. Well, that pretty much wraps up this page. But, there is plenty more to see on the other seven pages I have created in this Woldumar Scrapbook Photos section. Take your time wandering. Perhaps, like me, you will find time is irrelevant along these trails, and before you know it, you are taking a picture of a sun setting dramatically over Woldumar Nature Center.